Sam Cullen on her way to victory in the Oundle Magnificent 10k. James Mogridge and Sam Cullen delivered excellent performances to win the ‘Oundle Magnificent 10k’ races. Yaxley Runner Mogridge won the men’s race by over 90 seconds in 34.23 ahead of Phil Martin of Bushfield Joggers and young Nene Valley Harrier Alex Hampson. Eye Community Runner Cullen broke the ladies course record by finishing in 44.44, but she was pushed hard by last year’s winner Roslyn Louitt of Yaxley and Claire Maxted of Stamford. Over 200 runners took part including 35 from Yaxley and 28 from Eye so no real surprise that those clubs provided the two race winners! Another Yaxley Runner in top long-distance form was Caroline Woods who finished fifth in the cocmpetitive Nottingham Marathon. Woods completed the course in a personal best of 3:17:27. She was fifth lady and an impressive 106th overall in a race that attracts thousands of runners every year. Nene Valley Harriers’ 49 year-old golden oldie Sean Beard and Werrington Jogger Thomas Musson travelled a little further for their marathon fix. 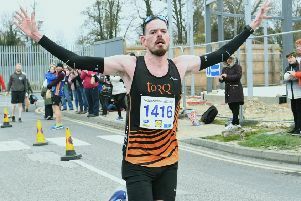 They took part in the Berlin Marathon with Beard, who was competing in just his second marathon, coming home in 2.52.28, knocking over four minutes off his only previous marathon time from London in 2013. Musson (31) has made great strides this season and he again impressed by finishing in a time of 2.48.38 despite his preparations being interrupted by injury. Closer to home Nene Valley Harrier Lloyd Kempson won the 10k race at West Pinchbeck in a time of 33.30, a personal best for the 21 year-old former Spalding Grammar School pupil. John Pike, a former Harrier who now runs for Newham & Essex Beagles was second with Drew Warnes of Harriers in third. Three ladies - Rebecca Hall (Corby AC), Philippa Taylor (Nene Valley) and Maggie Skinner (Stamford) finished in the top eight overall. Ellie Forrest of Peterborough Athletic Club won the Cambs County under 15 pentathlon title and claimed fourth place in the Eastern Athletics Championship. Georgina Price finished second and 10th respectively. Jamilia Smith won the County Under 17 title.